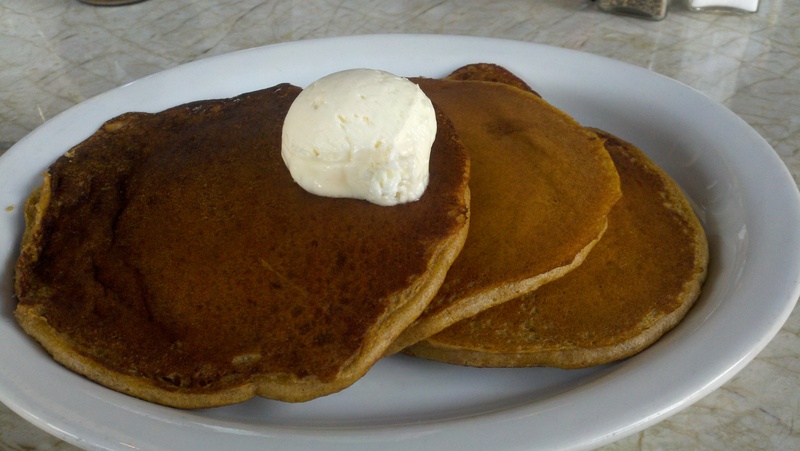 Today I visited Doughboys Café on 3rd Street between La Jolla and Crescent Heights, and decided to review their pancakes as my first blog entry. Until today I had only visited Doughboys once, and tried their absolutely amazing Challah French Toast (Bonaparte’s Breakfast)- so I was very much anticipating the taste of their pancakes. Although Doughboys has several tempting options, including Rice Krispy Pancakes, I decided to go with the Pumpkin Griddlecakes. As I’m not such a fan of nuts, I asked the server if it was possible to have the meal sans walnuts; she explained that because the nuts are baked into the batter, this was not going to be possible. The server did, however, mention her dislike of walnuts as well, and assured me I wouldn’t be able to taste them. Boy was she right! With a fantastic blend of pancakes, pumpkin, and walnuts, the first bite of Pumpkin Griddlecakes tasted like Thanksgiving morning. The pancakes were doughy but not heavy, and flavorful but not overbearing. While the pancakes were tasty with a hint of syrup, the scoop of whipped cream cheese on top sealed the deal. The Pumpkin Griddlecakes at Doughboys are the perfect holiday breakfast treat; just steer clear if you are allergic to nuts! *And as a side note, unlike many restaurants in LA, Doughboys serves breakfast ALL DAY LONG!